If you ask me what my favourite food is, I will say irekukin (I have no idea if that’s the right spelling, though). My mom has made it for me since I was a little girl, and even now, when I am home to visit, the very first thing I will ask is for her to make it for breakfast. They are very similar to crepes. They are Swedish, German, or Norwegian pancakes (depending on who you ask), and it is a recipe handed down from my Oma (grandmother in German, though she was my great-grandmother) to my mom. They are very thin, flat pancakes that you roll up and eat. My brother never added topping to them, I only add butter, and other people (like my husband) add jelly (gross). Usually when I make them, they don’t turn out as good as my mom’s…funny how that works. Anyway, we decided this is our official Christmas morning breakfast (our first married Christmas!! 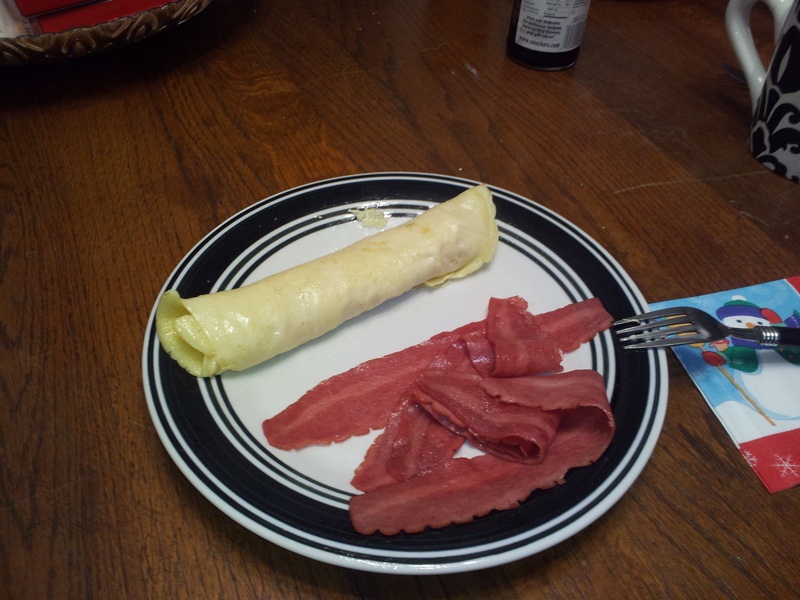 ), along with some turkey bacon. Don’t be fooled by only seeing one irekukin on my plate…I had at least 3.